Earlier this month I shared with you all that I had sort of taken a break from shopping at Banana Republic because I felt that the styles weren’t “me” anymore. 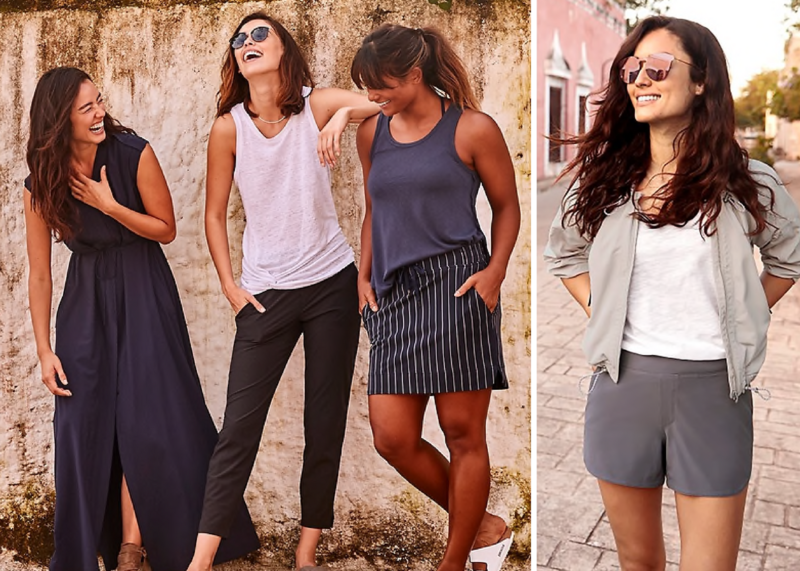 Well, I sort of felt the same way about Athleta for a while but, just like with Banana Republic, lately I’ve found lots of styles that I really like – and I’ve got 3 outfits from there all ready to go for Disney days! These are my 3 outfits that will be in my suitcase for Florida, so stay tuned to see them on my Instagram in the coming days! Overall, I was really pleased by the fit of everything, especially the shorts. I HATE wearing shorts. Really, really hate them. But sometimes they make sense and for this type of trip and plans to be active with the boys all summer, it made the most sense to go with shorts and the two pair I got from Athleta really have made me rethink my hatred for shorts. I got an XS in the Racer Run Shorts and a 2 in the Brooklyn Shorts and both fit me perfectly, not too tight and not too short. I think they’ll be perfect for athleisure days and the Racer Run style will be great for running (probably obvious in the name on that one). As far as tops go, I love that the Breezy Long Sleeve is slightly longer in the back (if you want a bit more booty coverage, I would size up!) and I ordered this sports bra to wear under it and peek out in the back. The Sunlover top was one I picked because of the UPF 50 in it and I like that open back for some cooling and just a fun detail! Just for reference, I got both, and the Chill Bomber Jacket, in XS and they all were a good fit with room to move. Well friends, sorry to cut it short but I wanted to share these with you before I have to start packing this week. By the way, we still have NOT told Jackson about our trip to Disney and still won’t until probably Friday – I can’t believe we’ve kept this a secret for so long!